BEIJING, CHINA—Tiananmen Square symbolizes modern China. The space forever will be remembered as the focus of the mass demonstrations dispersed by brute military force in 1989. Today the square is peaceful—but dominated by the ghost of Mao Zedong, likely the greatest mass murderer in history. His portrait hangs on the Gate of Heavenly Peace at the northern edge of the iconic Square. Mao’s mausoleum at the center draws thousands of visitors every day. The country has abandoned most of his thought since his death in 1976, but the leadership clings to his aura. The Great Helmsman was born in 1893. The son of a wealthy farmer, he helped found the Chinese Communist Party in 1921. He commanded Red Army forces with varying degrees of success while gradually achieving preeminence within the CCP. In Tiananmen Square on October 1, 1949, Mao proclaimed the establishment of the People’s Republic of China. “We have stood up,” he declared days before. Over time his rule became ever more erratic and brutal. After taking power he orchestrated campaigns against “landlords” and other “counter-revolutionaries,” which murdered as many as five million, or perhaps more. In 1956 he launched the Hundred Flowers Campaign or Movement, which offered Chinese an opportunity to speak freely: “let a hundred flowers bloom,” he said. However, Mao soon tired of criticism and began the repressive Anti-Rightest Movement. Executions were widespread, with some estimates of the dead hitting the millions. Barely a year after the PRC’s formation, Mao pressed for Beijing’s intervention in the Korean War, which was not settled until June 1953. Nearly 200,000 Chinese likely died, including Mao’s son. In 1958 came the “Great Leap Forward,” intended to rapidly industrialize China. Agricultural collectivization and backyard steel mills proved to be an economic catastrophe. Mao’s degree of knowledge is disputed, though many around him were aware of the social carnage. Between 20 and 46 million Chinese likely died during this period. In 1966 he launched the Proletarian Cultural Revolution: the resulting xenophobic power struggle/civil war consumed many of his colleagues. The prisons filled and millions may have died before Mao ended the campaign in 1969. The best estimates of the total number of deaths under the man known as the “Red Emperor” range between 35 million and 65 million people. Whatever the number, it numbs the mind. Mao did not intend all of these deaths, but they were the natural and predictable results of his policies. Moreover, he demonstrated no concern about the human horror of which he was aware. Mao remained the ultimate power in Beijing, opening relations with the United States in 1972. After his death on September 9, 1976, Deng Xiaoping, a long-time comrade of Mao who was periodically purged and rehabilitated, eventually won control. A decade after Mao’s death Deng had firmly set the PRC on a path of economic reform that would have horrified the Great Helmsman. But the Tiananmen Square massacre seemed a Maoist throwback and will forever tarnish Deng’s reputation. So far Mao’s legacy appears secure. The CCP now says that he was 70 percent right and only 30 percent wrong. His portrait and mausoleum dominate Tiananmen Square. I recently joined the crowd lining up to enter the latter. Stands line the route, selling flowers. On entering the mausoleum people deposited their flowers in front of a statue of a sitting Mao, backed by a painting of a peaceful mountain scene. He looked to be plotting his next madcap scheme. In the next room the Great Man, assuming it really is him, lies under glass beneath a blanket decorated by a hammer and sickle. He looked shrunken, his face pale. Two soldiers stood guard behind him. The two lines reunited and exited the mausoleum. Outside a variety of vendors offered Mao tchotchke. What home should be without a Mao picture or statue? Then the viewers flowed back into Tiananmen Square. How many revered the man, who killed more of their countrymen than did Japan and Chiang Kai-shek combined, is impossible to know. Maoism is dead. Mao Zedong retains some adherents on the left, but today Mao is more symbol of modernity than inspiration for policy. The current leadership is nationalistic, cynical, and ruthless. But top officials are not mad. Still, eventually the PRC will have to confront Mao’s legacy. A blander, more prosaic and bureaucratic authoritarian system has replaced his brutal, unpredictable dictatorship. The Chinese people remain in chains, though their fetters now are gold and silver. 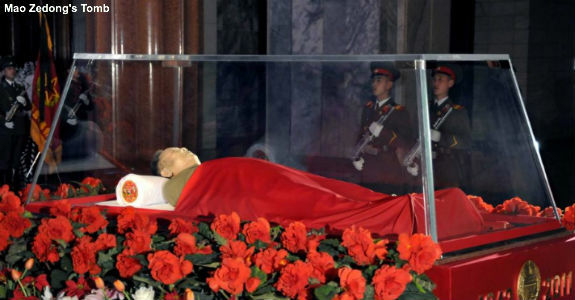 Someday the Chinese people will bury Mao along with his legacy. Then they truly will be free.